Always true to roots music in all forms, Skarnales performs a mixture of ska, reggae, rockabilly, swing, mambo, cumbia, and danzones, all with a punk attitude. Never letting down at a live show, the band has performed extensively throughout the United States and Mexico. Los Skarnales has shared the stage with such artists as Flaco Jimenez, Ozomatli, Los Fabulosos Cadillacs, the Aggrolites, Maldita Vecindad, the Slackers, the Specials, Agent Orange and many more. The band now consists of eight members including a full horn section. Metanoia hails from Houston and brings their mix of ska/fusion to the stage. 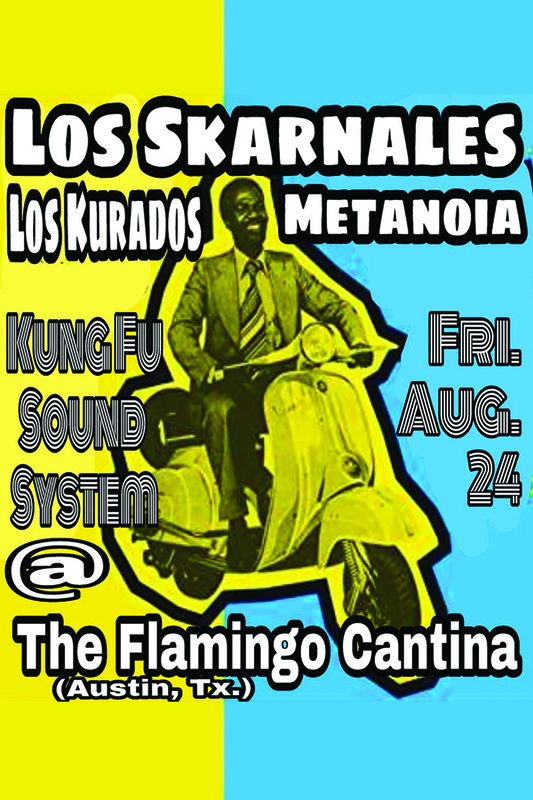 Los Kurados are an Austin fave with their hard driving horns and ska x Latin x reggae and punk influences. I mean, who doesn’t love a performer in a lucha libre mask? Doors open at 9 p.m. Latin music, ska, reggae y mas cumbia!